Hi Milli here this Sunday, checking in from Australia, where we have just celebrated Mother's Day. Send out Special Mother's Day Wishes to All Mother's where ever you might be today. I had a day at work today but still managed to have a special get together meal this evening with all my family. Chaotically Fantastic! Hi My post is now up and a Very Happy Mother's Day To All the Mums in Multiply. you generous wishes are received here in norway..thank you! beautiful shot! Big Smiles and Thank You Baz. *smiles* Love this tribute to mothers all over the world. Thanks for your comment, dear! Exquisite shot Milli! Beautiful color, detail and words. both are admired, both project endurance and strength ....both have a tender, fragile side. beautifullly expressed in your image and words! Thanks for your visit and always lovely comments! What a glorious photo! It looks like mothers, doesn't it. Thanks Virginia. I took the photo in macro mode and all I did was frame it up. Yes it reminds me very much of mothers and the colours and delicate petals of Hydrangeas never ever let us down. My mum used to grow these and now I do lol. Thanks, Milli, for your visit and kind comment, as always. Wonderful..brings back a lot of memories. Love your shot of the Hydrangea. I am a bit slow this week. Computer problems. 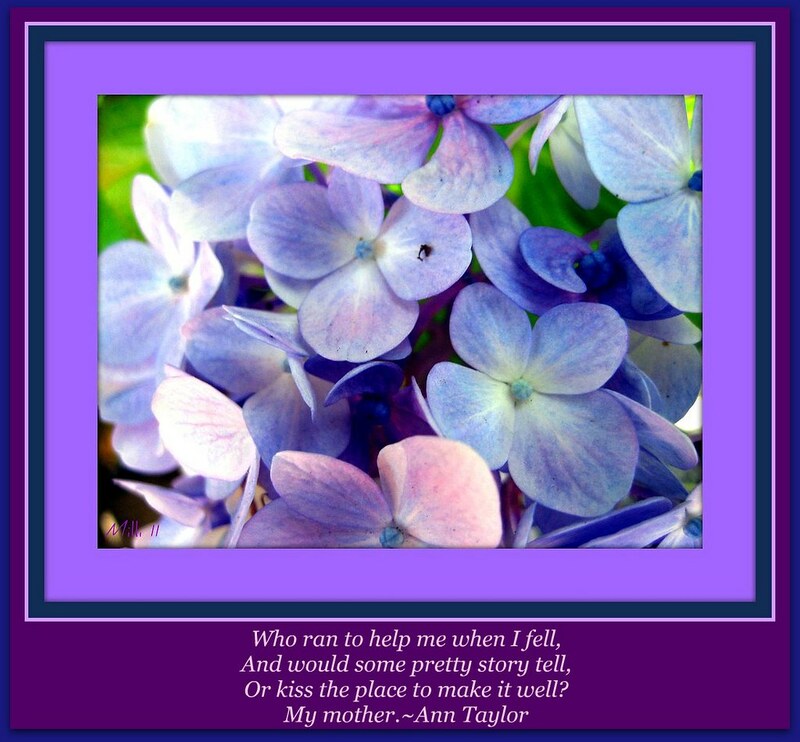 Gorgeous flowers.. err picture and words...Hope you had a fantastic Mother's Day!